Authorities went on a hunt and what they found was not quite so alarming. A man snorkeling in the Colorado River near the Arizona and California border sent authorities on a hunt after he alerted them to what appeared to be "skeletal remains" at the bottom of the river. After he called police in Arizona, authorities launched a search for the remains on Monday, and divers from the Buckskin Fire Department swam down to investigate. To everyone's surprise -- and relief -- the skeletons, seated comfortably in lawn chairs, turned out to be fake, police said. They were even wearing sunglasses and were placed in a way as though they were having a tea party, the La Paz County Sheriff's Office said. One of the skeletons was holding a sign that included the words "Bernie" and "dream in the river," though the entire sign is not legible, police said. The sign also had the date of Aug. 16, 2014, which is possibly when the skeletons were placed there, police said. "I don't think they were trying to set up anything to scare anyone. I think they were gonna try to be funny," Lt. Curtis Bagby said. He added he thought the sign could be a reference to the movie "Weekend at Bernie's." 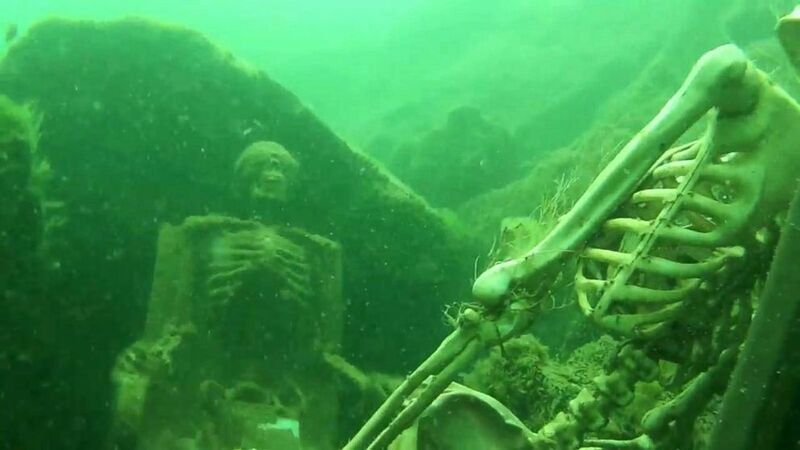 (Courtesy Eric Foerstner) Authorities find fake skeletons underwater in Arizona. "Things happen, we go all the time to false alarms," Bagby said. "That's just a first-responder's life. We're trying not to be overly concerned about it, not make too big a deal out of it." The divers will recover the skeletons sometime this week, Bagby added, saying he's considering placing them outside the sheriff's office as a joke. "We like to show some things that are fun, some levity too," he said. "But in the meantime, don't think it's OK to go put something there."